Your bags are all packed, you checked into your flight online, and you are all set for your trip. Except for one small thing, you have to make it through the airport. Getting through the airport can be the most stressful part of any vacation. But have no fear; your airport survival guide is here! These five tips will help you make it through the airport with ease and you’ll still have the energy to play a few rounds of golf and a game of bridge with your friends once you reach your destination. First and foremost, you need to allow ample time for you to check your bags, get through security, find your gate, and maybe even grab a bite to eat. It is always better to arrive at your gate early, rather than to rush through the airport thinking you are going to miss your flight. 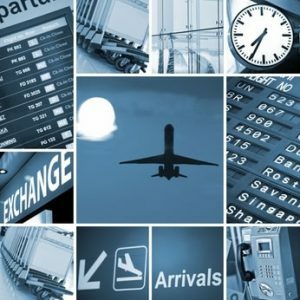 Many airports offer live security point waiting times online that you can check on the day of your flight. The Dublin Airport suggests adding on even more time if you need assistance with your bags or use a walker or cane. when sending any messages or surfing the web. Identity theft is a real problem, so you do not want to take it lightly. One of the biggest delays in getting through the airport is the security checkpoint. points out that if people would come prepared the security line would move much faster. So how can you prepare? Have your 3.4-ounce liquids in a clear plastic bag before you ever even leave your home. If possible, you should also wear slip-on shoes and skip the belt. While in the security line, read the signs to make sure that you have removed all necessary items from your carry-on. And finally, give yourself one last pat down before heading for the metal detector to ensure that you haven’t missed anything. Another great tip to make your traveling just a little bit easier is to take advantage of your smartphone. Most airlines will not only allow you to check-in using your smartphone, but you can also store your boarding pass on it. Yes, that means no shuffling around a piece of paper as you go through security, grab a snack, and work on your laptop. When boarding your flight you can simply pull up the boarding pass and the attendant can scan your smartphone. Another way to make your trip more enjoyable is by saving yourself some dough. There are many ways that you can save some cash while traveling. Everyone knows that you can save money by only using carry-on luggage, but you can also save money by bringing snacks from home and traveling with an empty water bottle. You can’t take water through security, but as soon as you get to the other side you will be able to fill your water bottle up at a drinking fountain. Now that you know these five tips to make your trip through the airport more enjoyable, it is time for you to sit back and enjoy the flight and maybe finish that crossword puzzle or settle in for a snooze, next stop your relaxing vacation! This entry was posted in Travel Tips and tagged air travel, airport survival, airport tips, airports, travel on June 12, 2017 by travel.